TNC works with the hospital to decide what drugs/medicines are needed and places an order approximately every six months. 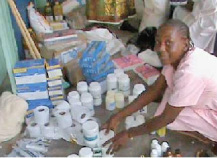 Medicines that are available are purchased in-country, and the remainder are ordered and air freighted into Nyadire form the international organization Medical Assistance Programs (MAP) www.map.org. Average cost per order is $15,000 and financial help is always needed. Teams also hand-carry donated medical supplies on each visit to Nyadire.